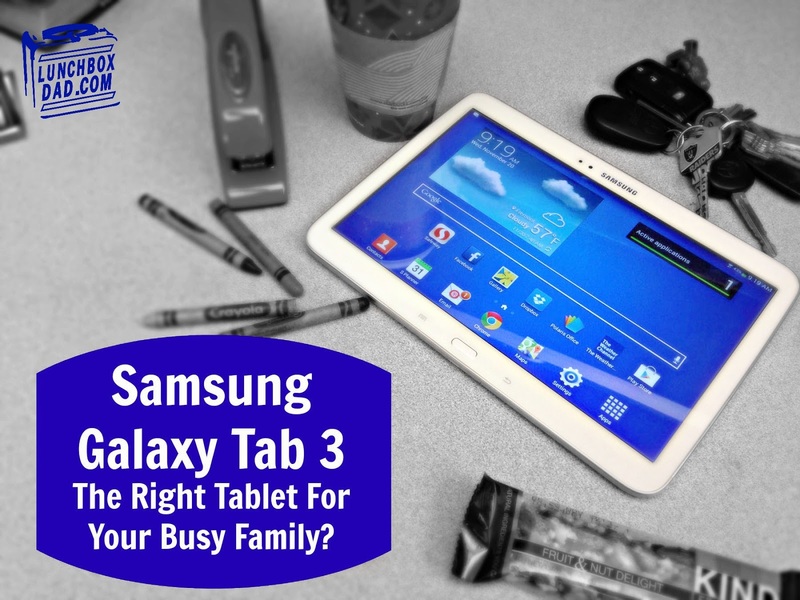 Lunchbox Dad: Samsung Galaxy Tab 3: The Right Tablet For A Busy Family? Samsung Galaxy Tab 3: The Right Tablet For A Busy Family? Here at Lunchbox Dad I not only want to give ideas help you have healthy and fun meals for your kids, I want to introduce you to products that make your life as a parent easier. The right tablet can help will help in not just one, but in many areas of your life. As a parent, I know that a day for your family can run the gamut from looking up recipes, to kids doing homework, to looking up sports scores, to watching a TV show with your spouse. 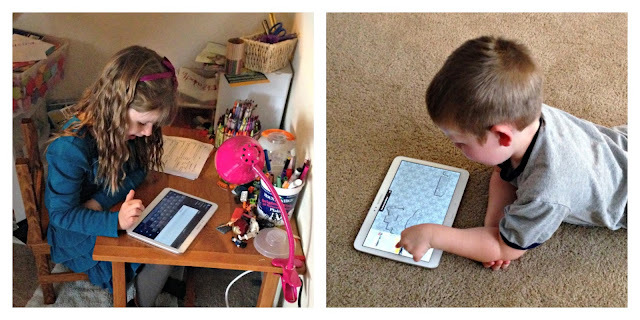 In short, parents don't need a tablet that can do one thing amazingly well, they need a tablet that can do everything they ask of it. You aren't just buying a tablet for yourself, you are buying it to be used by your whole family. Keeping this in mind, this post will tell you about my experience looking for the best tablet for my busy family. Hopefully it will also help you shop for and decide if the Samsung Galaxy Tab 3 will be right for your family and your fast pace lifestyle. 3. What size is best for me? 5. Do I need internet connectivity all the time or just WiFi? After researching online about a great tablet that might work for families, I decided to try out the Samsung Galaxy Tab 3, 10.1 model. I liked that it has the Intel Atom ZS560 processor in it. The online tests that I read gave great reviews so I was confident that this chip would run well any app that I threw at it. I also liked that the Galaxy Tab 3 runs on the Android operating system. I wanted to test out this OS in real life parenting situations. I chose the 10.1 inch size because it is big enough to watch movies on, but still small enough to be extremely portable. For our family, this size would be the number one choice in any tablet. Last, I like the price point of the Galaxy Tab 3. It retails for much less than a new iPad. When you are a family on the budget, you can't break the bank for one device. I made my way over to Best Buy because when I am not completely sure about a product, and need to test it before I buy it, this is my go to store. I also find the staff there to be pretty informed about the products in their respective departments. 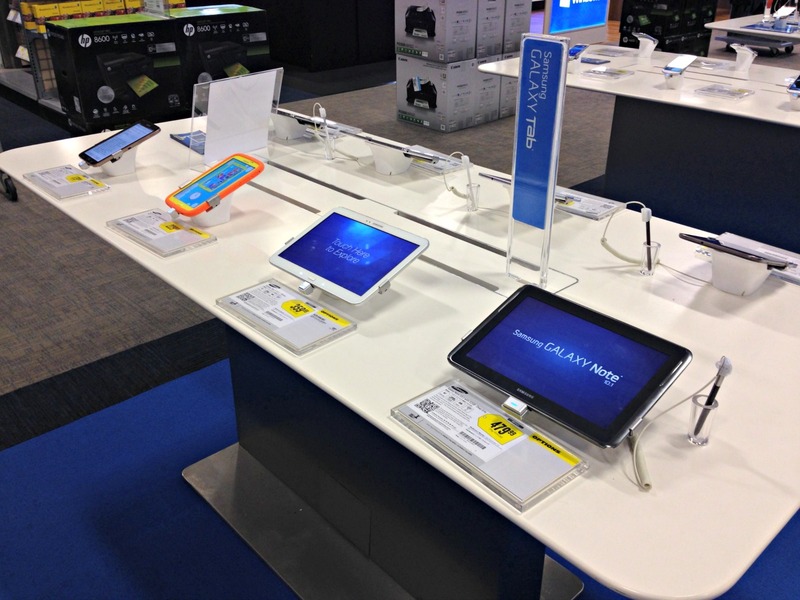 I found the tablet section easily, but unfortunately the first Galaxy Tab 3 wasn't plugged in so the battery was dead. An employee arrived to help and they directed me over to the Samsung specialty area. 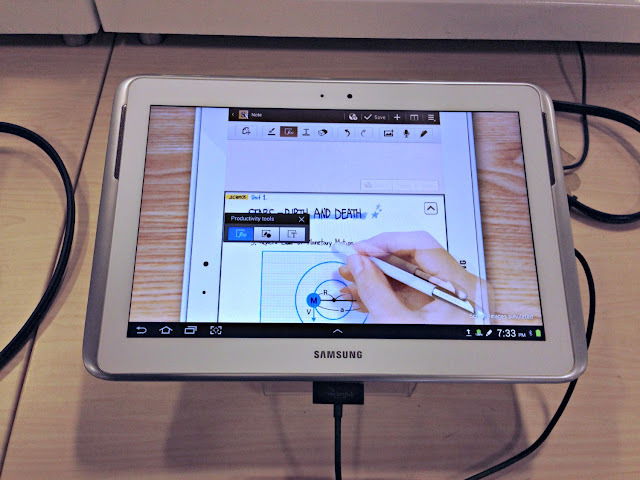 This are was new since my last visit and it gave me chance to see and compare the different Samsung tablet and phone models. Q. What are some of the benefits of a tablet that runs on the Android operating system? A. One great feature is that it is highly customizable and you can change the appearance and use apps that aren't available on an iPad. Another feature is that you can not only store files on a removable memory card, but you can also run apps from that card as well. Q. Do Intel chips in a tablet make difference and how does this compare to other tablets that have intel processors? A. The Intel chips in general are high quality. The one in the Galaxy Tab 3 will perform as good or better than Intel chips in other tablets. This processor will run any app that you want, including ones that stream video such as Netflix. Q. How does the screen resolution compare to other tablets? A. The resolution is not as high as the retina display on the iPad or some other tablets in the same price range. The resolution is 1280x800. However, it will play HD video without problems and you won't be able to tell much of a difference. Some other questions you might want to ask are: What are the pros and cons of this tablet? I want to mainly use a tablet to do these four things ___________, how would this tablet handle those tasks? How do the features of this tablet match up with other tablets in the same price range? The last thing I asked was if Best Buy would price match an online retailer who had the same model for a little less. This was no problem and they happily price matched the online retailer. The great thing about buying it in store is you can take it home right then, rather than waiting for it to arrive through the mail. When I brought the Galaxy Tab 3 home, my whole family put it to the test. My 3-year-old son loves to play learning games and puzzles. I downloaded a few free apps from the Google Play store and he was able to pick them up and use them with no problem after I showed him how. He loved the puzzles but breezed through them quickly. The only issue was that the free versions were short and you could pay for the full version of every puzzle he did. It was the same with most children's apps I looked at. My 7-year-old daughter also likes playing kids games but she is in school and has homework. She is in a spanish immersion program so I had her use a spanish language learning app and also Google Translate. I wasn't sure she would be able to use the tablet on her own, but to my surprise she was able to use it with only a few instructions from me. The small size also fit well on her desk she uses to do homework. I was very pleased with how it helped in her school assignments. I also tested the Galaxy Tab 3 out with streaming video from Netflix and Hulu+. Sometimes you need a distraction for your kids but it is not practical to have the TV on. I was very happy with how smooth the video played and it never experienced lag. I also ran HD video straight from the tablet. The tablet with Intel Atom processor had plenty of power to handle any video I tried. The issue I had with it was with the quality of the streaming video. For some reason it wasn't quite as good as other tablets I had seen. I don't know if it was because of the apps themselves or because of the screen resolution. It wasn't terrible by any means but if you are extremely picky about video quality, you will want to test out those apps first. I have cable internet that gets 25 mbps on average so I know that wasn't the issue. I didn't have the same problem with video that was stored on the tablet. That video played and looked terrific. I also felt as though the sound was a little soft. The speakers face out the sides so you lose volume because of that. Its not an issue in a quiet room, but if you are in a room that has a dishwasher running, a washing machine going, or kids yelling it is hard to hear without headphones. My wife is not a tech person but she has some very specific things that she likes her smartphone to do. This tablet would have to do the same things as her phone only be more convenient in order to pass her tests. She was impressed right away with the size and weight of the Galaxy Tab 3. The screen is 10.1 inches but it is only .31 inches thick and weighs in at 1.12 pounds. She thought it that felt even lighter than that and she could probably even fit it into one of her larger purses easily. She also loves taking pictures of the family. My wife feels its impractical to hold up a full-sized tablet to take pictures at amusement parks or restaurants, but if you want a tablet to do take pictures, this will do the job. Regardless of where you take pictures, the camera is an important part of a tablet. I took the picture below with a Samsung Galaxy S4 phone and then the same picture with the Galaxy Tab 3. It was an overcast day and there was no editing done to either picture. 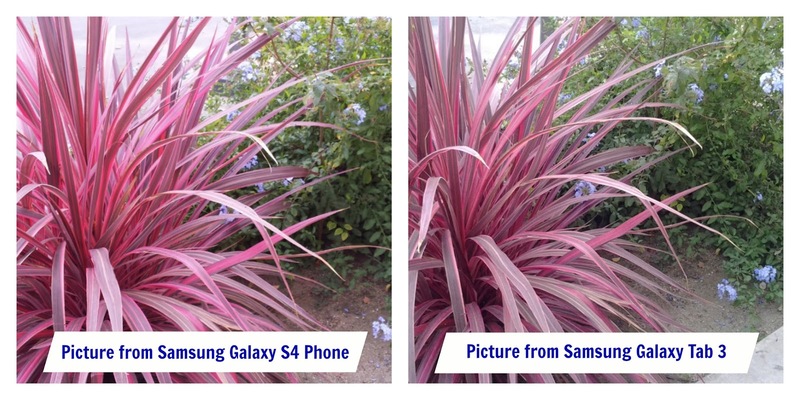 You can see the picture from the Galaxy S4 phone is a little brighter and the colors are a bit more vibrant. This has to do with the differences in backside cameras (13MP in the S4 compared to only 3.2MP in the Tab 3). The new iPad Air tablet has a 5MP backside camera, but is that worth an extra $200-$300? The frontside camera works fine for selfies and video chat. So this tablet is not excellent for taking all of your high quality family pictures but if there are moments when you need a picture right away, this will be the tablet to do the job. For my wife's other tasks such as using her grocery store app, answering emails, and going on Facebook, the Galaxy Tab 3 worked perfectly. I already mentioned that my wife appreciated the size and feel of this tablet. This immediately stuck out to me as well. This ultra portable tablet feels as light or lighter than any other tablet I have held. 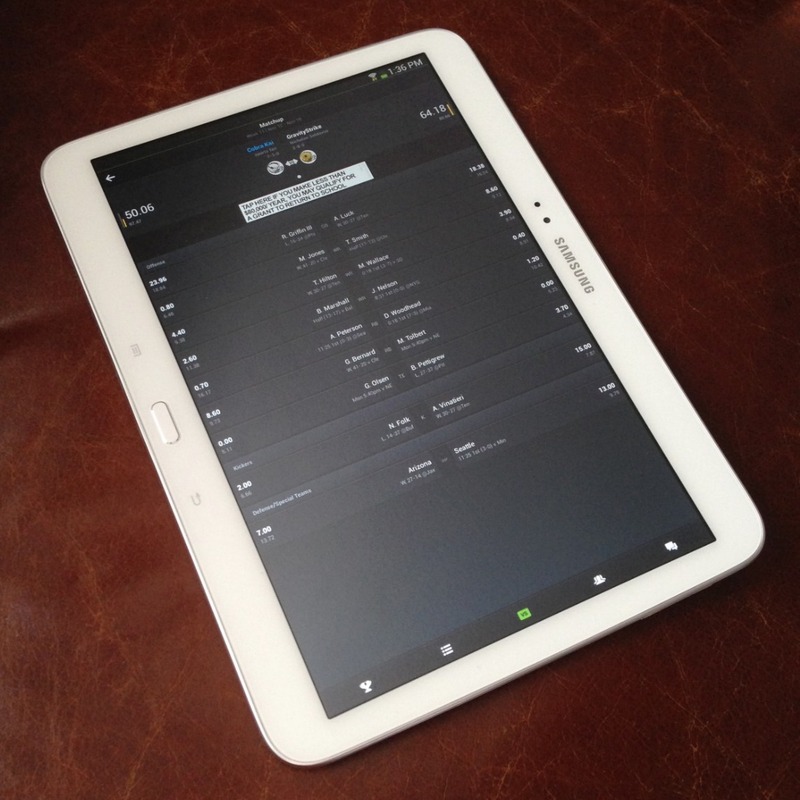 I'm a huge sports fan and it was wonderful to be able to watch the football game and have my fantasy football scores right in front of me without lugging around a big laptop. Since I needed this tablet to work for the whole family it was also important that it be able to run all of our apps well. The Intel processor did not disappoint. In my tests there was no lag and the tablet performed as advertised. The processing power in this tablet is one of its greatest strengths. Along with those few things above, and the ones I mentioned in other sections, the biggest deal for me is the selection of apps available in the Google Play store. The big knock on this Android app store has been the lack of development of apps specifically designed for tablets. As of November 21, Google has redesigned their app store to make it easier for tablets to find apps that were actually designed for tablets. They hope this will push app developers to put more effort into improving their tablet apps. Since this redesign is only one day old, we will have to see how this helps. There is no shortage of apps in the Google Play app store and those that are made for tablets perform beautifully on the Galaxy Tab 3. The problem is that some apps, such as Twitter, still look like phone apps stretched across the tablet screen. I imagine with the store redesign new tablet apps will be on their way shortly. I especially enjoyed using Google Chrome for web browsing, Dropbox for file storage, and Google Maps for navigation. SwiftKey is an unbeatable keyboard app that makes typing easy. I also found Evernote to be extremely useful for taking notes at work and writing recipes for my blog. I am not a huge gamer, but I do enjoy a video game from time to time. I tried and liked Angry Birds Star Wars and NFL Pro 2013. I was especially impressed with the graphics and smooth gameplay of the racing game GT Racing 2. You really have to see it to appreciate it, plus it was free! The Intel Atom processor helps to make playing games on the Galaxy Tab 3 a joy. I also found that although the screen is extremely responsive, it is sometimes easy to push the settings and back buttons on accident. These are located on either side of the main button on the bottom front of the tablet. It is also easy to inadvertently highlight something or turn the page when reading an ebook. This could be just getting use to holding the tablet while reading and isn't a big deal, just slightly annoying at times. When it comes to battery life, Samsung says the Galaxy Tab 3, 10.1 has about 9 hours of internet usage or video playback. Although I wasn't able to reach that level, I found the battery to have plenty of life for a family on the go. You don't want your tablet running out of power when you are out at the store, on a trip, or when that perfect picture moment with the kids arrives. I never had to worry about the battery, even with regular usage. I ended up having to charge it once every 2-3 days. Of course battery life all depends on the settings you use and the Galaxy makes it easy to adjust those settings as needed. The last feature that thrilled me was storage space. The Galaxy Tab 3 comes with 16GB of internal memory. You can add memory as often as you like with a removable micro SD memory card (not included). I have found these on sale for as low as $20 for 32GB of space. That size memory card is the perfect size to get started with. The main drawback to an iPad is that you are not able to upgrade the memory after you buy the tablet. This is not an issue with the Galaxy Tab 3 so you can keep loading as many apps, photos, and videos as you want. You just switch out the card if the current one fills up. Overall, I would highly recommending the Galaxy Tab 3 for your family. It has become a fun and useful part of ours. It isn't perfect in every single area, but what tablet is? The Intel Atom processor helps it perform like a champ and it provides enough flexibility that each member of your family will enjoy using it, no matter what their needs and passions are. The low price also makes it a great value for families searching for a high performance tablet, but are on a budget. 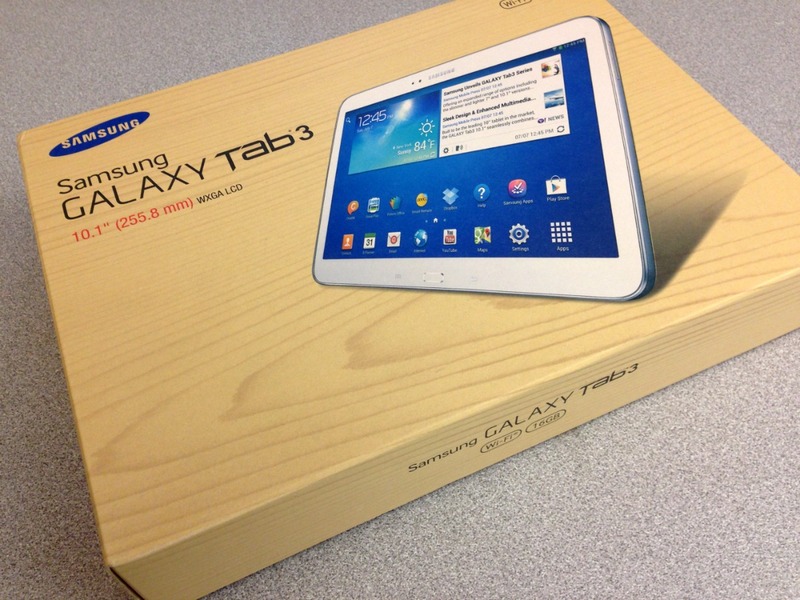 My suggestion is to head down to Best Buy to learn more and play around with the Galaxy Tab 3 yourself. You just might go home with a new "super tool" for your family. What questions do you have about the Galaxy Tab 3? Is there a feature you want to know more about? Ask me in the comments below! I do my best to respond to all reader's comments! Thanks for reading Heather, I hope this post helped you make a good decision about your next tablet! There are plenty of good apps for reading and editing word docs and also viewing .pdfs. I would highly recommend it for that. I have used it at work for exactly that purpose. Yes you can, thanks for asking!